With its touch screen and stylus controls, the Nintendo DS seems like it was practically built for real-time strategy games. Sadly, entries in this genre have been few and far between. Publisher CIRCLE Entertainment comes out of the woodwork with Castle Conqueror, an all-new RTS for DSiWare. Referred to as a strategy game for casual gamers, this title is a fun adventure and a nice introduction to the genre. As soon as the game starts, you get to choose to play as either a male of a female commander. The difference in choice lies not only in aesthetic, but also in abilities; the male character has extra abilities that deal mostly in offensive upgrades, while the female tends to focus on defense. These abilities power up the strength or defense of your troops and buildings for a short period of time. There is a very short tutorial that explains the basics of battle, and then you are immediately dropped into the game. An overworld map allows you to play any of ten levels in whatever order you choose. Once level ten is complete, another part of the map opens up with an additional ten. There are fifty levels in all, some of which will take you five minutes, and some of which will take you no more than 30 seconds, depending on your level of skill. After each, you will be awarded a certain amount of gold depending on how quickly you conquered your enemy. Gold is used to purchase upgrades that affect your troops’ status such as strength, defense, and speed, or to purchase items. All of the items are a one-time purchase, and they increase the effectiveness of your power-up abilities. Upgrading your stats is a necessity if you wish to advance further, so don’t be surprised if you find yourself replaying earlier stages again and again to grind for gold and upgrades. The gameplay is straightforward and easy to master. All you have to do is drag the stylus from one building that has your troops in it to whichever building you would like to attack. You are allowed only five soldiers on the field at once, but you have to pay close attention, because as soon as one dies you may have to send another into battle. The action is frantic and quick, and you will often find yourself acting before you have time to think. With a game like this, precision controls are key, and Castle Conqueror seems to hit the nail right on the head. The entire game is based around touch controls, leaving the DSi’s buttons completely useless. Fortunately, every tap and slide of the stylus seems to react at just the right sensitivity for effective battles. Though Castle Conqueror does not give you the option of varied difficulty levels, the campaign’s difficulty curve is incredibly fair in letting players know when its time to upgrade their stats. You will know almost immediately upon entering a level whether you’re prepared to face the challenge ahead of you, or if you should turn tail and head back for more grinding. There is a stunning lack of variety offered here, but that doesn’t seem to take away from the game’s replayability in the slightest. The desire to win every battle in the quickest and most efficient way could have players revisiting past stages again and again. It is literally the same campaign whether you choose to play as a male or female, but the different abilities add enough variety to make the game feel fresh for at least a second playthrough. Among the lacking features is multiplayer. While it would have been fun to hop online and pit your army against your friend’s or a stranger’s from around the world, or even locally for that matter, this opportunity was sadly missed. The visual and audio presentation in Castle Conqueror is simple and utterly adorable. 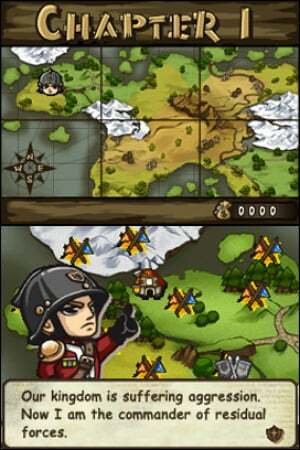 Big-headed and big-eyed chibi characters are often displayed during dialogue on the top screen, and even more litter the lower screen in the form of attacking troops. All of this while uplifting and energetic battle music plays on in the background. The character sprites are clean and the music sounds crisp, adding to the enjoyment that this game already offers. Though it lacks variety, Castle Conqueror is a downright fun and addictive adventure. With 50 replayable levels and a decent amount of stat upgrades, you’re likely to spend about five hours on this title before playing it to completion. Old fans of RTS games might not find this one to be exactly to their liking, seeing as it is a very stripped-down take on the genre, but it would be a great introduction for newcomers. 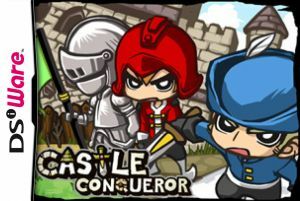 If you’re the kind of gamer who obsesses over having the highest stats and winning every battle, look no further than Castle Conqueror. Meh is Meh as Meh can be Meh. Seems good and meh at the same time. I might get it if no other DSiWare RTS comes out soon. Why does the cover art make it seem like it takes place in the medieval era, yet the screenshots make the soldiers look like those from the early 1900's? I saw the main picture for the game and I was like "Wow, good graphics!" And then I saw screenshots. Excellent observation, Qwikman! There is absolutely no explanation for this. This game seems worth a purchase, but there's just so many better games I could buy with 500 points. We need more games like 3D Space Tank. Does anyone know if Q-Games are going to make any more DSiWare? Hmmmm. I've been interested in getting into RTSs. Might get this sometime. @5 Exactly what i thought lol. Its sooooo cute~!!! I love strategy games~!! "The visual and audio presentation in Castle Conqueror is simple and utterly adorable. Big-headed and big-eyed chibi characters are often displayed during dialogue on the top screen, and even more litter the lower screen in the form of attacking troops." I hate this kind of game because they cheat at the end, throwing huge numbers of troops against you, while leaving you with relatively few troops. Without power-ups, may as well forget it. With, then it becomes too easy, hence the troop flood. Those 50 levels may be replayable, but there is only one strategy for me: Capture as many neutral castles as quickly as possible, and siege continuously. Outcome is pretty clear within 30 seconds. It's rare that you can hold out. Comparing this to absolute chess, then I'd say this game is not only blitzkrieg, but also handicaps you with a missing rook, but that's okay because the AI is so poor, you'll win anyway! Not my greatest pleasure. And the fact that the game froze on me didn't help. I had to just let the battery run down because the power button didn't work, and I'm not about to unscrew the battery from the device. Music still plays, though. Weird, huh? Artwork may be cute, but I can't help but think that maybe Chibi Gophers would be way cuter! SOUNDS GOOD, but I don't really like RTS, so probably not going to buy it. I think the problem with RTS games on the DS is that they aren't very hard. After all, RTS works best with a mouse and keyboard but I would think it wouldn't be too hard to make good controls given the stylus and touchscreen. All of the entries I've seen for RTS on this system are always "beginner friendly" which is a bit of a problem for people that are deep into the genre. I have a hard time finding a challenging one. Anyway I'm afraid I'll have to hold my points and wait until a more appealing game comes along. 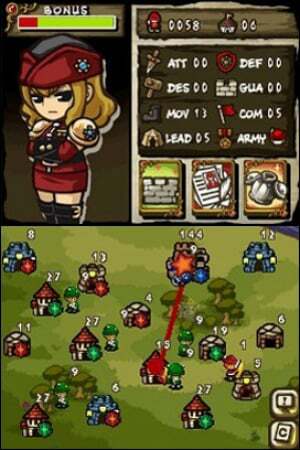 @Tare, have you played a game called Command and Destroy for the DS? Aside from a few "quirks" the gameplay is exactly like a PC RTS. Check it out if you can find a copy. @Ron_DelVillano I glanced over your picture at the end of the article, and almost jumped. I thought it had been updated with a picture of you clean shaven!